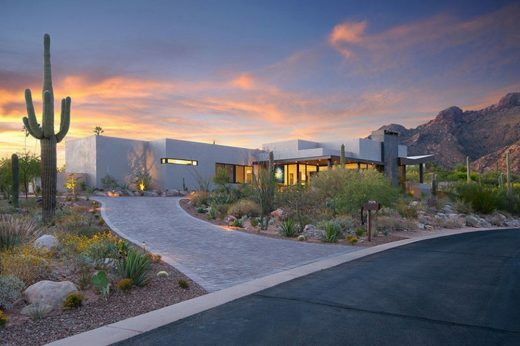 Client’s Vision: A modern, open design with minimal barriers to capture the stunning desert and mountain views. 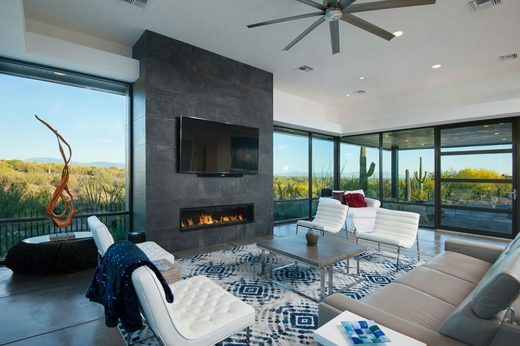 Design Approach: Dynamic simplicity expressed in Modern design elements that allow the natural desert to become an integral part the interior living experience. 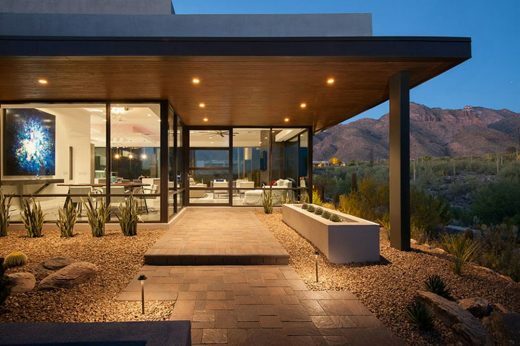 Elegant minimalism drives the choice of rectangular, sand-finished stucco walls, ceramic panel accents, and a rectangular flying roof over the Patio and Front Entry supported with thin columns. Floor to ceiling window walls provide extraordinary views of the desert and mountains beyond the Pool and Spa. Through the Front Entry, the Great Room’s all-encompassing window walls conspire to bring inside the ever-changing desert views. Floating rectangular soffits and recessed ceiling and edge lighting combine to quietly differentiate the various working and entertaining spaces. Tongue and groove wood panels line the Patio roof, itself slanted upward so as to not restrict mountain views from the inside. 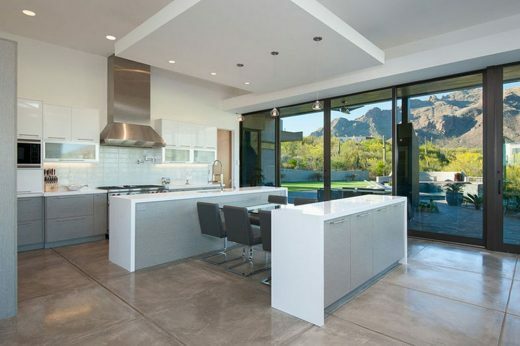 A few steps on to the Patio, and into the desert, are the recessed Outdoor Kitchen and Dining area, as well as an Infinity-edge Pool and Spa.